Scroll down for "Blankets That Require a Sewing Machine"
to reject blankets that are not of good quality. smoky & musty smells, scented detergent, softener, dryer sheets; and pet hair. they can be given to children who need a warm blanket hug. Our local hospitals will no longer accept fleece blankets for preemies. Please don't buy just one yard of fleece for a fleece blanket. The blankets are too skinny. We prefer single layer fleece blankets with straight fringe - NO KNOTS. Before fringing, neatly cut off the sevages (the two edges that are curled or wavy with tiny needle punched holes near the edges). 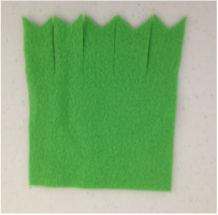 If you plan to fringe all four sides, cut out all four corners as shown - size depending on the length of the fringe; 3" corners for 3" fringe, 4" corners for 4" fringe, etc. This is very important - if you don't cut out the corners the blanket will not lay flat. If more than one person will be fringing a blanket, decide on the width & length of the fringe before starting to fringe the blanket. Don't use beads or any embellishments on blankets - they can be a choking hazard for children. Check your blankets carefully for straight pins. It's much better that you find the straight pin in your blanket - not the child receiving your blanket. Place masking tape 2" from edge of fleece. Then lay template along edge of tape. Cut from the edge of the blanket to the lines on the template. Make template by drawing lines 1/2" apart on a piece of card stock, then cut the card stock into 2" strips. Cut with pinking shears - no longer than the length of the blade. We prefer single layer blankets without knotted fringe. for a good quality blanket that we can give to a child. Follow directions above about trimming selvages. Cut out corners when fringing all four sides of a blanket. 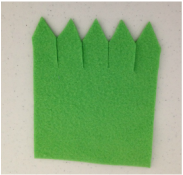 Make a cardboard template for a guide for cutting out the corners: 5" square for 5" fringe, 2" square for 2" fringe, etc. If you don't cut out the corners when fringing all four sides, the blanket will not lay flat. It will curl up at the corners and look more like a bowl or basket than a nice flat blanket. You don't need to fringe all four sides of the blanket - you can fringe just the two opposite sides. However, if you do fringe all four sides, be sure to cut out all four corners as shown above. Cut out a 5" corner from all four corners and then cut 5" fringe before knotting the fringe. If you don't cut out the corners before tying the fringe, the blanket will not lay flat and will curl up like a bowl or basket at the corners. Cut fringe 5" long cutting both layers at the same time so that the fringe matches up for knotting. Neatly knot the two layers together. Square up fleece and remove selvage edges before starting to make a Braided Finish Blanket. Cut out 3" squares from all 4 corners. This is very important. The Braided Finish Blanket will not lay flat if the corners are not removed. Place a strip of masking tape 3" from the edge of all four sides. Turn up the fleece to the meet the masking tape and pin securely. Sew with a zigzag stitch directly over the edge of the turned up fleece. Cut 1/2" wide fringe. Don't cut through the stitching and be sure to stop no further away from the zigzag stitch than 1/4". Use a large crochet hook or your fingers to pull the loops through to make the braid. When you get back around to where you started, pull the first loop through the last loop and secure with needle and thread. If you don't have a corner ruler you can use a dinner plate as a guide to draw the curved corners. Use 1 1/2 or 2 yards of fleece for each blanket. Square up and straighten the fleece. Trim the selvage off the fleece with a wavy blade rotary cutter. You can use a straight edge blade if you don't have a wavy blade. Important - keep the wavy blade a least 1/4" from the ruler or you will nick the edges of the plastic ruler and dull the blade. Sew a zigzag stitch or simple decorative stitch 2" from the edge all the way around the blanket. Clip all edges to make fringe - if you used the wavy blade - clip in the notch and you will get a perfect 1/2" clipped fringe.